Weight: 8.79 ct; size: 11.83 | 11.60 | 7.88 mm; shape: octagon; colour: light bluish violet; strong; clarity: slightly included; cut: fair; treatment: none. Clean specimen; step style cut with large window. A variety of quartz. 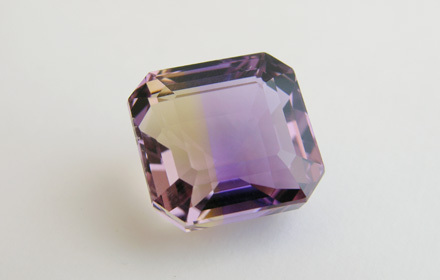 Ametrine crystals are made of alternating sectors of violet and yellow to orange colour. While the violet sectors are made of amethyst, the yellow or orange sectors are not made of citrine, because they are coloured by inclusions of iron compounds. Upon heating ametrine the violet sectors pale, while the yellow-orange ones keep their colour.